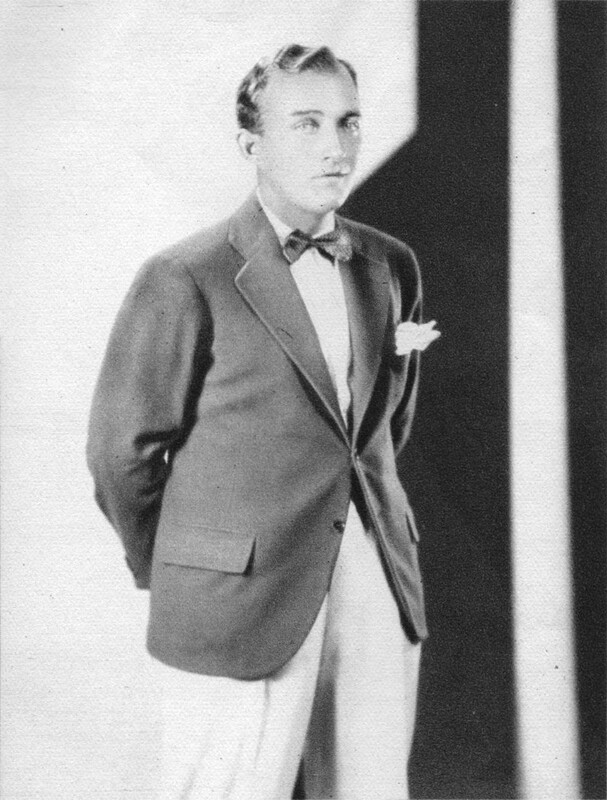 Bing Crosby in the early 1930s, as pictured in the Eveready Book of Radio Stars, c. 1932. Old Time Blues has honored the iconic Bing Crosby before, with a look at his theme song “Where the Blue of the Night”, at which point I eulogized him quite thoroughly. But now let us turn our attention two years earlier to Der Bingle’s first solo effort, while he was still just one of Paul Whiteman’s Rhythm Boys. Born on May 3, 1903 in Tacoma, Washington as Harry Lillis Crosby, Bing got his nickname from a local girl, after a popular comic strip in the Spokane Spokesman-Review called The Bingville Bugle. That is unless you’d prefer to take Bing’s own version of how he acquired the moniker: when he was “a mere broth of a lad,” he liked to play cops and robbers (or cowboys and Indians, by another account), and carried around a pair of toy six-guns all the time, saying “bing! bing! bing!” in imitation of firing. One way or the other, Crosby was inspired by Al Jolson to turn from binging to singing. While he was in college at Gonzaga University, Bing joined a band of high school students, including Al Rinker, called the Musicaladers. Later, Bing dropped out of college to go with Rinker south to California (he got the last laugh though, when Gonzaga U awarded him an honorary doctorate), where the duo cut their first record in 1926: “I’ve Got the Girl” and another unissued title with Don Clark’s Los Angeles Biltmore Hotel Orchestra (evidently before Earl Burtnett took over the gig), albeit recorded a bit too slow. With help from Rinker’s big sister Mildred Bailey, the pair got their big break later that year when they were hired by Paul Whiteman to sing—with the addition of singer and songwriter Harry Barris—as the Rhythm Boys. Though the Rhythm Boys made several records of their own, Bing didn’t make his solo recording debut until 1929. Crosby remained with Whiteman’s troupe, recording for Victor and Columbia, until 1930; the band had traveled to California to make their blockbuster motion picture King of Jazz, and the Rhythm boys decided to stick around afterward to try and make it big in Hollywood. They made one record with Gus Arnheim’s Cocoanut Grove Orchestra for Victor—”Them There Eyes”—but parted ways thereafter, so Bing embarked upon his solo career in earnest. He continued to sing with Arnheim’s orchestra until 1931, when he signed with Brunswick. He continued to record for Brunswick until producer and manager Jack Kapp “poached” him for his new Decca label in 1934. The rest (as they so often say) is history, Bing continued to skyrocket to stardom through the 1930s and 1940s, securing his position as one of pop-culture’s first “superstars,” which he maintained until his death on October 14, 1977. Columbia 1773-D was recorded on March 14, 1929 in New York City. It is Bing Crosby’s first solo record, though many more preceded it with Bing taking a secondary role. Bing is backed by Matty Malneck on violin, Roy Bargy on piano, and the seldom heard Ed “Snoozer” Quinn on guitar. First up, Bing sings the charming Jo Trent and Louis Alter composition “My Kinda Love”, delivering a performance quite a bit jazzier than he would later become known for. 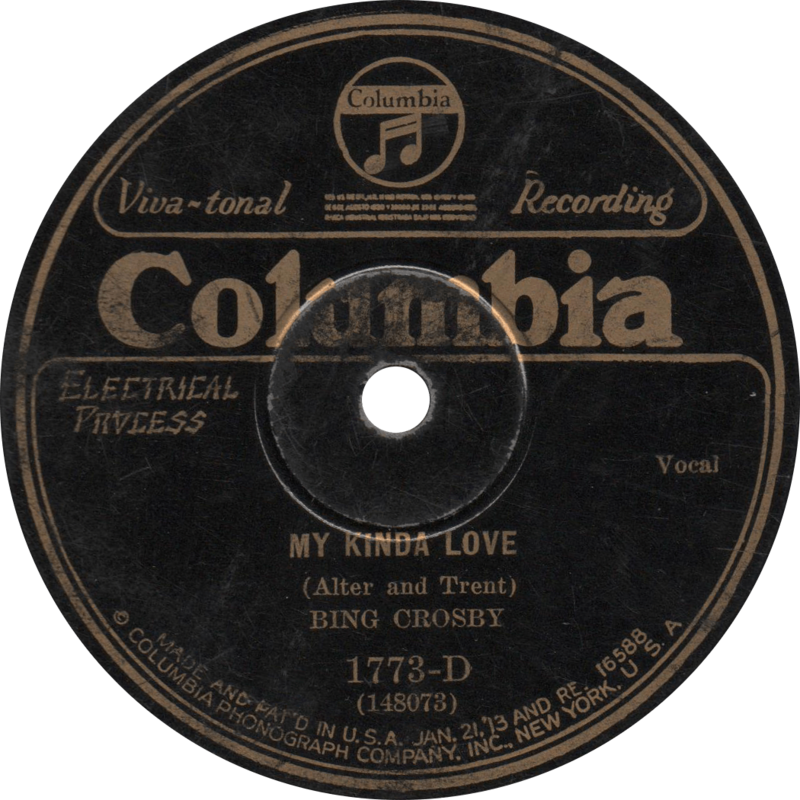 My Kinda Love, recorded March 14, 1929 by Bing Crosby. He backs it up with “Till We Meet”, another fine performance. You may note that Bing in these earlier days tended to sing in a higher register than in his “crooner” days. 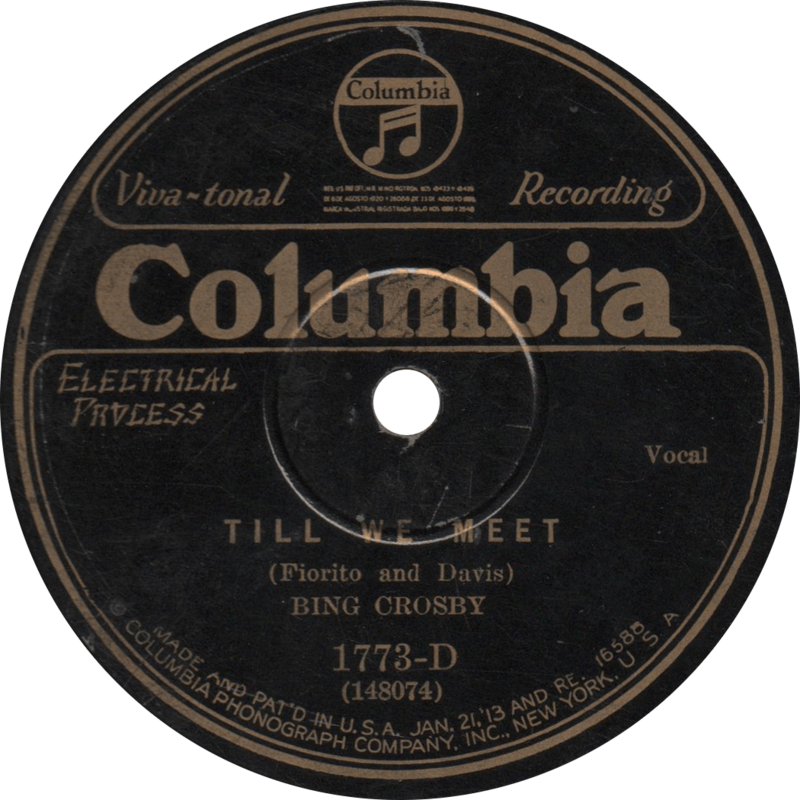 Till We Meet, recorded March 14, 1929 by Bing Crosby. This entry was posted in Records and tagged 1920s, 1929, Bing Crosby, Columbia, Jazz, Matty Malneck, Popular, Roy Bargy, Snoozer Quinn by R. Connor Montgomery. Bookmark the permalink.